Although I’m an adventurous eater and love all kinds of Asian foods, it hasn’t been until relatively recently (the last 5 years or so) that I discovered how much I love Vietnamese food. Sad, because out of all the types of Asian cuisines I’ve tried, Vietnamese cooking calls out to me the most, with its pungent flavors of fish sauce, chilies, lime and fresh herbs. It’s ironic because although I lived in France, where there is a large Vietnamese population, my experience was limited to snacking on the occasional nem (fresh roll), which you could buy at the counter in many Vietnamese-owned groceries. Here in Metro Detroit, there is also a significant Vietnamese population in the Madison Heights area (see this post about some of the Asian specialty stores in that area). A couple years ago Marvin turned me on to a restaurant on John R just north of 11 Mile Rd. called Thang Long *insert immature jokes here… you know you want to* and I’ve been hooked ever since. It’s not much to look at when you walk in- the decor is all rose-colored and clearly hasn’t been updated since the early ’80s; the vinyl seats are torn in places. There’s a long table in the middle of the restaurant where the family congregates to do food prep, wrap silverware, etc. But none of that matters because when you go to Thang Long, you go for the food. I’ve tried several dishes at Thang Long, but my favorite is the Duck & Cabbage salad. 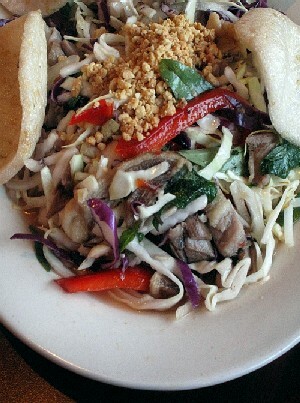 Cabbage is shredded and doused with a dressing of vinegar, fish sauce, chilies and garlic; there are slices of red bell pepper, mint and basil leaves, a sprinkling of peanuts, and best of all, pieces of shredded duck breast. Last year I acquired Andrea Nguyen’s book Into the Vietnamese Kitchen (check out this post for a great stuffed tofu recipe from that book), and happily it contained a recipe for a very similar salad that used poached chicken breast in place of the duck. I made a batch and was delighted to find that, with just a little tweaking, I could now make my beloved duck salad at home. Best of all, it’s an incredibly easy recipe AND super healthy- there’s not even any oil in the salad dressing. The salad is great when it’s first made, but I also like it after it “marinates” in the dressing and the cabbage softens a bit. Either way, you’ll be glad it makes a big batch because it’s addictive and easy to eat huge portions! Photo notes: The first photo is of the salad I made at home with chicken, following the original recipe without any modifications. The photo of the salad with the herbs and red pepper is the actual duck salad at Thang Long (hence the crappy lighting). The things on the side of the plate are delicious fried shrimp chips. If you’re looking for a more weekday version of this dish, this salad works just as well with chicken rather than duck. I’m not usually a fan of the rather flavorless white chicken breast meat available in most stores (use Amish or organic if possible! ), but the salad has so much flavor of its own that it works out. For the chilies, in a pinch you can do what I did and use dried bird’s eye chilies; just pour a small amount of very hot water over them and let them soak a bit before using. The items marked “optional” are ingredients that Thang Long uses in their salad that were not included in Ms. Nguyen’s recipe. 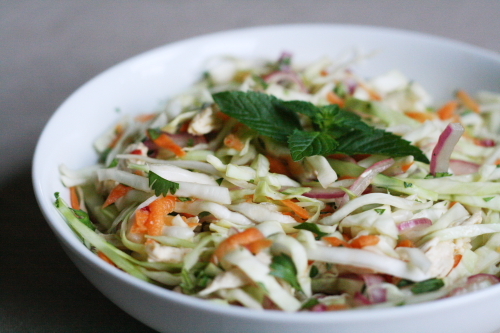 Meanwhile, place the cabbage, carrot, cilantro and red bell pepper (if using) in a large bowl. Put the onion or shallots in a small bowl and add the white vinegar just to cover (the vinegar tames the onion’s bite). Let sit for 15 minutes. Drain well and add to the cabbage. When the meat is cool enough to handle, remove the skin and shred the meat by hand along the grain; when cool, add to the bowl of cabbage. 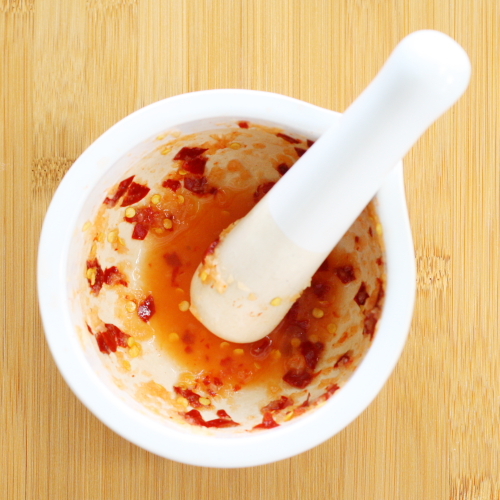 Using a mortar and pestle, mash the garlic, chilies, sugar and salt until they form a fragrant orange-red paste. Scrape the paste into a small bowl and add the rice vinegar and fish sauce, stirring to dissolve and combine. Just before serving, pour the dressing over the salad and toss well to combine. Taste and adjust the flavors as needed, balancing the sour, salty, sweet and spicy. Transfer to a serving plate, leaving behind any unabsorbed dressing. Garnish with the herb sprigs and the peanuts, if using (or leave on the side for your guests to add as desired). This entry was posted in Asian food, Cheap Eats, Fast and Easy, Meat, Poultry & Rabbit, Recipes, Restaurants, Salads & Salad Dressings, Vietnamese Food and tagged Andrea Nguyen, Asian food, cabbage, chicken, duck, easy recipe, healthy, low fat, Madison Heights, poached, salad, Thang Long, Vietnamese food. Bookmark the permalink. wow, so yummy looking. haven’t been to long’s yet, love cabbage so much! Looks great! I’ll have to try that salad next time. I almost always get the combo vermicelli bowl with crab and shrimp rolls. “An Asian Rick Moranis”… LMAO! I think I do know who you’re talking about though! I’ll check out the #42 next time I go and see if I can figure it out. I’m glad you’re digging the food of my people! 🙂 Dish looks good and legit. That Andrea Nguyen book is good indeed; it’s sitting on my coffee table. this looks great! 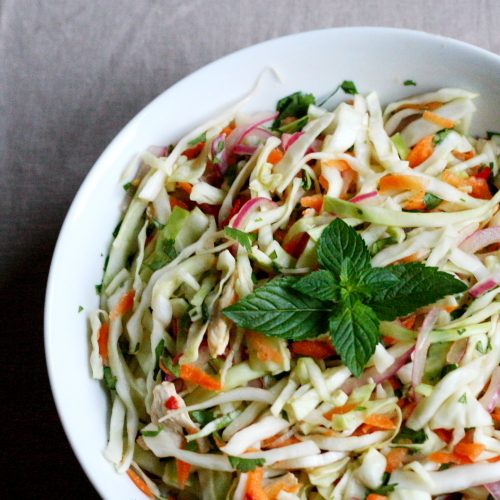 vietnamese salads are definitely underrated and there’s so many different types. Oh yeah! That salad looks awesome! In the past ten years Vietnamese has become my favorite cuisine hands-down. There’s a place in Richmond, Va. called Mekong that does amazing things with lemon grass and pork. Love it! I am so looking forward to trying this salad. Sounds like it would be great to make for weekday lunches! very intersting! i’ve never really tried duck but i think i might since i love world cuisine!!! I made this for dinner last night, and it was absolutely delicious!!! My husband was skeptical when I first showed him the recipe, but we both ended up devouring it (there’s only a tiny bit leftover). A few notes/changes: (1) I used boneless, skinless chicken breasts, and they didn’t fully cook using the method outlined above. I ended up needing to bring the water back up to a simmer (after letting it sit for 40 minutes), and cook it for another 5-10 minutes. (2) I used a whole red bell pepper, as 1/4 seemed like practically nothing. (3) I skipped the basil, and chopped the mint and added it along with the cilantro, rather than adding it as garnish. (4) I reduced the fish sauce in the dressing to 2 Tbs (instead of 3), and thought it tasted just right (was going to add the 3rd Tbs if it seemed like it needed it, but it didn’t). (5) And finally, I doubled the amount of peanuts thrown in at the end. Thanks for a fantastic recipe! I’ll definitely be making this again! Hi Bonnie, glad you liked the recipe. I do suggest using a meat thermometer to ensure the meat is fully cooked, because there can be a lot of variables. Also, did you notice that the 1 Tbs of the fish sauce is supposed to be used in the cooking water? The dressing only has 2 Tbs. As for the garnishes, I’m all about doing things to taste, especially with something as flexible as a salad.